When selecting which would be the best family property in Philadelphia, I knew I wanted a to be in the heart of the historical district on our first trip, so I chose the Monaco Philadelphia. I’ve always enjoyed the guest experience of the Kimpton brand: playful and stylish. The brand consistently creates beautiful, bold— but very comfortable— spaces sticking to the Dorothy Draper principles of hotel design. Because most Kimpton properties are in city centers, they also provide sophisticated food and drink options. The Signer keeps his eye on the Monaco Philadelphia. An Monaco Philadelphia alcove off the lobby. First come, first served bikes for Hotel Monaco guests in Philadelphia. The Monaco brand is known for wonderfully bold style. There’s something so meaningful about being completely immersed in the historic area of Philadelphia. Looking out the hotel room window to see iconic historic buildings is what we typically have to fly to Europe to do. The hotel is adjacent to Independence Hall, and across the street facing the hotel is a statue of The Signer, honoring all of those white men who signed the Declaration of Independence. A view from my bath tub at the Monaco Philadelphia. It’s also a luxury to have such a sophisticated place to return to escape the crowds so easily. To lie in a new and modern deep soaking tub at sunrise overlooking the site of the signing of the Declaration of Independence was a very beautiful thing it’s such a fun juxtaposition to be amidst Philadelphia’s core historic center in a hotel that so playfully weaves modern design. I feel badly for the designers of Independence Hall when the hotel across the street outshines them so well. We loved the copy of Alice in Wonderland next to the bed in our suite. The suites worked very well for families at the Monaco Philadelphia. I stayed at several Monaco properties when Kimpton hotels launched the brand created such buzz with its design. 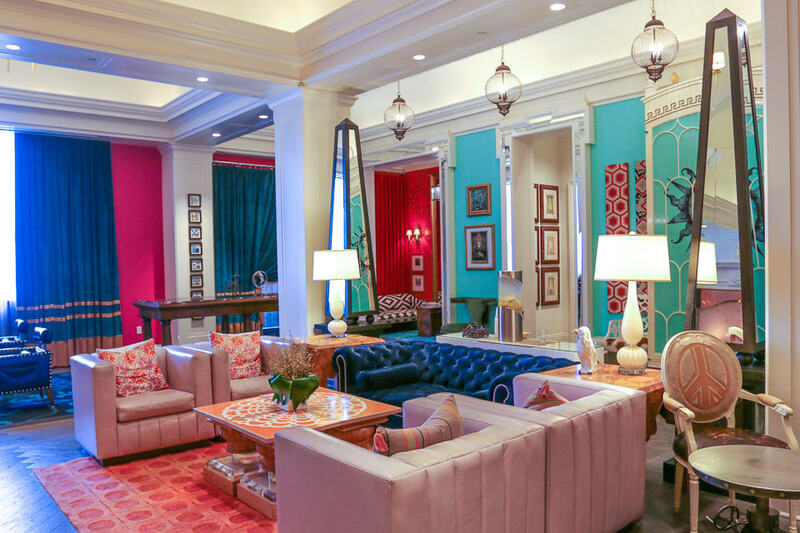 This was long before I had children, and yet I didn’t realize at that time how well suited all of the elements that Kimpton incorporates the Monaco Philadelphia hits a home run with families, too. Bicycles in the lobbies next to Chinese jardinieres, illuminated tea-cup pendant lamps outside elevator lobbies, and a tall ship crystal chandelier are little touches I loved seeing. The genius of the Kimpton brand is the use of whimsy. It’s so authentic and fun for both children and adults to enjoy. Why have a boring white bathrobe in every hotel room when leopard robes exist? A kite, yoga mat, and leopard robe should be essentials for every family vacation. A Rocky inspired robe at the Monaco Philadelphia. Where else could you peer behind bright yellow raincoat closet doors to find a kite, a yoga mat, and a leopard robe waiting for your vacation fun? To play up the local Philadelphia flavor, a robe made of sweatshirt material inspired by the movie Rocky also hung in a closet lined with beautiful fashion advice wallpaper, “When in doubt, wear red!”. Pure awesome. The front desk agent presented my children with canvas backpacks filled with numerous little trinkets that could have filled an advent calendar. They spent several minutes going through each item including a Kimpton passport, candies, a yo-yo, a bounce ball, a stuffed animal, and crayons. Each child is presented with a canvas cinch sack filled with goodies. The étagère adjacent to the bed came with a vibrantly colored hardback of Alice’s Adventures in Wonderland which fit perfectly with the fantasy design. Kimpton hotels offer a pet goldfish for your stay upon request. So cool. Better yet, many Kimpton properties offer the adopt a goldfish program where a family can host a their own pet during their stay. My children thought this was beyond the pale, and found a goldfish far more fascinating to stare out in a hotel room than our own fish at home. Go figure. The Red Owl Tavern off the lobby is the perfect family-friendly restaurant for foodies in a tourist district. It’s a casual atmosphere but the kitchen is serious about delivering flavorful dishes. My children enjoyed steak frites, pasta, and succotash that they adored, I had it succulent scallops with grilled baby corn and my husband enjoyed had a salmon over kale pomegranate salad. Red Owl Tavern works really well for foodie families staying at the Monaco Philadelphia or for those site seeing in the Old City. The Red Owl Tavern at the Monaco Philadelphia serves salmon over a kale and pomegranate salad. Scallops and succotash at the Red Owl Tavern in Philadelphia. It’s typical that my children never eat the breakfast I order them, so I had ordered to share a very small amount of food for breakfast from room service. It was our biggest mistake of the day, as everything was flawlessly prepared, and my kids ate everything. The lounge on the rooftop is 21 and over, but if you are able to break away from the kids it’s a beautiful spot with city views. The long wall of flames and very effective heat lamps will keep you toasty outside. The indoor lounge is beautiful, too. The penthouse lounge and bar at the Monaco Philadelphia offers beautiful city views. Independence Hall, the Liberty Bell, The Betsy Ross House and the National Constitution Center are all an easy walk from the Monaco Philadelphia. As long as the weather is nice, the walk to the main area downtown with various urban parks is also close by. The Monaco Philadelphia is within steps of the Liberty Bell. Lolly Lolly in the Old City in Philadelphia can provide the attire for all little urban hipsters. Lolli Lolli, not far from the hotel, offers urban chic children’s clothes and toys. Think $40 rock ‘n’ roll T-shirts with the Police and Jimi Hendrix and Boho chic coats for girls. There’s also a great selections of Melissa and Doug and other toys to play with on vacation. Adjacent to the hotel is Historic Philadelphia, housing a 3-D film similar to a presentation at Epcot discussing the symbols of American history. A very enthusiastic Benjamin Franklin impersonator narrates it. I asked my four-year-old what he thought his response, pointing to a Benjamin Franklin replica, was, “That man really freaked me out.” If I had really wanted to freak him out, I would have rented the historic costumes families could rent in the lobby store to prance around town. Jones restaurant in Philadelphia serves hipster comfort food. A cucumber cocktail at Jones in Philadelphia, great for family brunch. Jones is a great retro comfort food restaurant two blocks away that works great for families at lunch, dinner, and weekend brunch. The 1970’s inspired interior will make you think that this is where Mike and Carol Brady took the kids out to eat on those very special occasions when Alice went on an extended vacation. Mike liked the tater tots, and Carol liked the stiff cocktails. Sometimes when hotel rooms and suites are just so good that our plans are jettisoned out the window. We’d intended to see the Philadelphia Thanksgiving Day Parade, a much more manageable experience than the Macy’s Parade in New York, but there was really nothing that could lure us away from our cozy haven. Some suites are to hard to leave. Morning plans forgotten. We were guests of the Monaco Philadelphia, but these opinions are entirely my own. I love Kimpton hotels. That soaking tub + all the bright colors look so inviting. We still haven’t taken the kids to Philadelphia yet but it is on our list so I pinned this to come back to in the future! WHAT?! People on Twitter were recently recommending Kimpton hotels as the best choice for traveling with kids, but now I see why! The colors! The goodie bags! The goldfish! YES! Seriously, that decor has me swooning. Brilliant. This hotel looks amazing! What a great way to see an awesome city. I love how the hotel is so close to everything and how you can borrow a pet fish while you are there – who would have thought :)! Love the colors and the location! Adding this to our must stay list!!!!! Oh, I know all too well the difficulty of leaving digs that are so comfortable and luxurious… It’s a terrible, first-world problem to have 😉 I’ve not stayed at any Kimpton properties but I see/hear the name a lot. This property looks fabulous! I was just in Philadelphia last fall so I know the location is superb. Love the Rocky robe, too!